Bahrain International Airshow (BIAS) 2018 has announced details of its flying display line-up including spectacular shows by numerous international teams with the Italian team Frecce Tricolori headlining the lineup. The show, held under the patronage of His Majesty King Hamad bin Isa Al Khalifa and under the supervision of Shaikh Abdullah bin Hamad Al Khalifa, Personal Representative of HM the King and Chairman of the BIAS Organising Committee, will kick off on November 14 and run for the next two days at the Sakhir Airbase. A daily flying display program spread over five hours will include spectacular displays by numerous regional and international flying teams, for both trade show visitors from November 14 to 16, and for the first time this year, extended by an additional day for the public area from November 14 to 17. Besides Frecce Tricolori, which is making its debut at the BIAS, alongside other renowned teams including the Emarati team Al Fursan, the Russian Knights, the Global Stars Acrobatic team, the Black Falcons Parachute Team, a Paramotor Solo Display, Mark Jeffries “Little and Large” display, in addition to flying displays by the Royal Bahraini Air Force, the UAE Air Force, and the US Department of Defence. With a team composed of 10 aircrafts, 9 in formation and 1 solo, Frecce Tricolori is the Italian Air Force Aerobatic team, and has been flying since 1961. 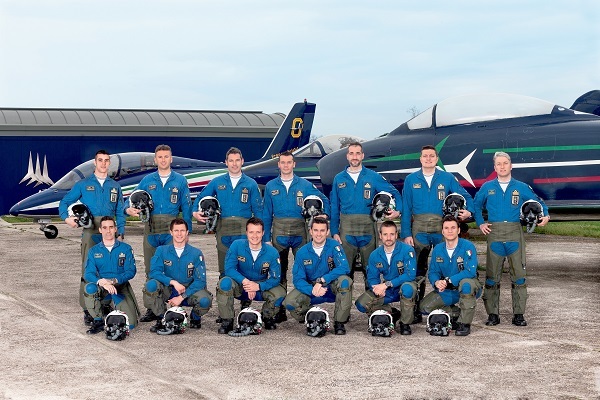 Pilots of the team all have to be from the Italian Air Force Fighter Squadrons, selected amongst a wide range of candidates, said the organisers. To qualify, they must have at least 750 flying hours on jet planes and a certification of ‘combat readiness’ from the Italian Air Force Division, they stated. The team and support team consist of 100 people; officers, NCOs and enlisted personnel, all of whom work to ensure that the maneuvering display is carried out with top level skill. The team uses the MB-339 PAN aircraft, which has been used in the show since 1982. It is an Italian built aircraft that is used not only for flight activities, but is also used to train new military pilots at the 61st Wing in Galatina. Three years ago, the team devised a new manoeuvre called “Scintilla Tricolore” or Italian spark, which was introduced to celebrate the 55th anniversary of the National Aerobatic Team. In addition to the Italian team, the Russian Ministry of Defense team will also be participating in the flying displays through the Russian Knights Aerobatic Display Team with the Sukhoi 125. Besides the participation in the flying displays, Russia will also be exhibiting its latest addition to its 7 member fleet, the Sukhoi Super Jet.